Your bed. Optional retractable canopy wall enclosures to add privacy, or to make a comfy little room. Cup holders. Built-in HD projector. Built-in 5 point sound system. Home theater screen that slides down at the foot of the bed. 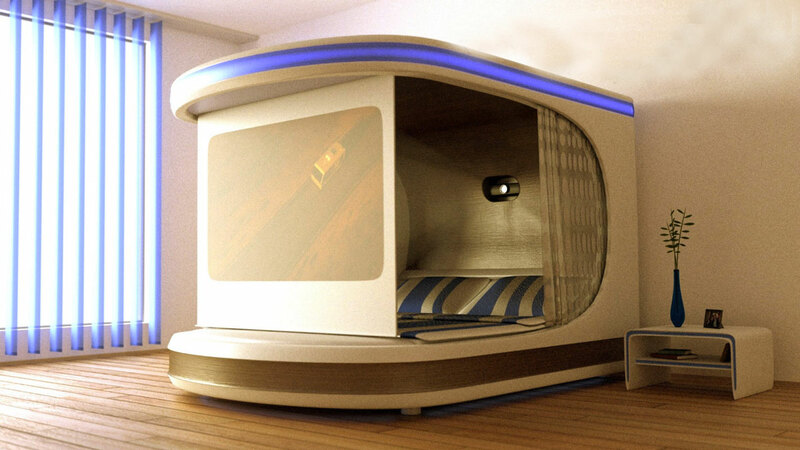 All these features and more come with the iNyx Self Contained Bedroom Bed, for an anticipated retail price of $10,000. Before you scoff, note that HiCan sells a similar bed – for an extra fifty thousand dollars! The iNyx version costs less than a new car, and you’ll spend more time in your Bedroom Bed than inside any automobile. What else does iNyx’s masterpiece offer? Built-in LED lights of ambient blue, red, or white. Undercarriage and overhead lighting to create light shows, or to add just the right amount of lighting for your purpose. A lighting mode that mimics the night sky. A built-in aromatic fragrance dispenser system. Built-in collapsible mechanism in the footboard for attaching a flat-screen television. Built-in tables that pull out from underneath the bed, for work or eating. And, the mattress is king-size.